The miniature work of CIT student Marie Alexis is part of Craft ACT's Emerging Contemporaries 2019 exhibition, featuring outstanding works from the Canberra Region until 16 March. 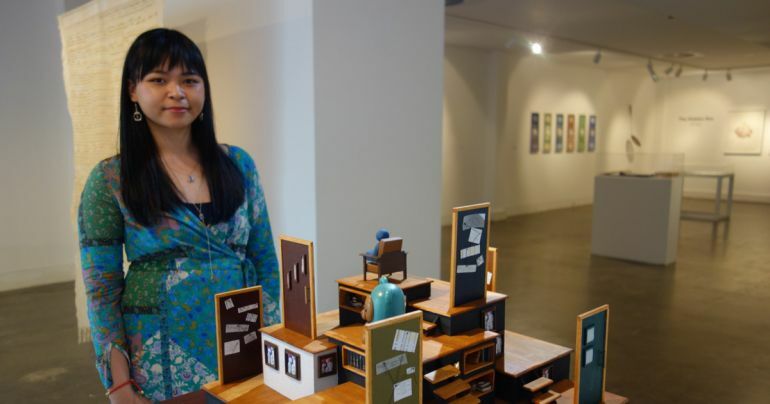 Philippines-born Marie conveys her point of view through the creation of miniature scenes, or dioramas and describes her fascination with details with the Tagalog word "kilig" meaning exhilaration. The notion of the enticement of children by gambling games fuelled her latest work. "The School of Odds series are dioramas that tell a narrative about how it feels to first enjoy a video game for its fun elements, but then fall for its psychological traps to get you into a cycle of spending and gambling," Marie said. Repeat, the last narrative in the series, is about the vulnerability of minors playing video games which mimics the stage of a gambling addiction that has its victims justifying their choices by using logic to their own downfall. "I strongly believe this is a social and mental health problem that should be discussed more, especially as these games become more accessible with smart phones and incentives to share the game with other players," Marie said. Her experience at CIT has nourished Marie's artistic skills, with the program aiming to guide each student in the development of their own unique artistic voice. CIT Teacher Paul Murray said, "Marie has used the vocabulary of toys creating adorable animals and geometric forms to attract a child's attention, then includes sophisticated clues that have to be deciphered to reveal the dark intent." Marie said she sought much advice from her CIT teachers while developing her career in a niche art form. "They were always candid about what they thought and the critique sessions helped filter through a lot of unclear ideas. I really got to see my work in the eyes of others and not just how I want it to be presented." "CIT has been immensely helpful in preparing me for the rigours of the art industry. One subject that really helped me was the Professional Practice class. This taught us how to deal with the business side of being an artist and what it entailed to apply for studio spaces and grants," Marie said. Marie is eager to rent a studio space that would allow her to expand the range of materials she uses at home and hopes to run travelling exhibitions addressing other issues, such as climate change denial and absolute gender roles. "While I don't expect everyone to agree with my opinions, I want my work to be entertaining, voyeuristic and immersive," Marie said. Learn more about CIT's Diploma of Visual Arts (CUA 51115).